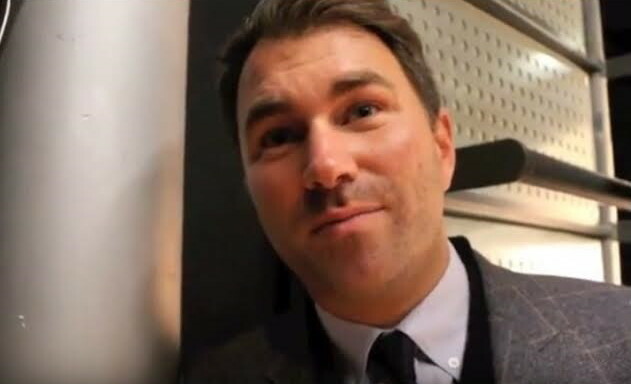 Eddie Hearn is not overly optimistic about his chances of making a fight between Anthony Joshua and Tyson Fury in 2018. Hearn’s chief complaint is the 60 percent purse split that Fury (25-0, 18 KOs) is demanding for him to agree to fight Joshua. In addition to the 60-40 deal, Fury wishes to have the champion’s benefits bestowed upon him. Fury, 29, wants to be treated as the champion. Technically, he’s still Ring champion. That wasn’t taken away from him during his 2 years out of the ring. Fury wants to enter the ring last and wants to select the changing room. Fury will need to come down a bit in his asking price for the fight to get made. Insisting on a 60-40 split with Joshua is a deal breaker right out the door. Even a demand for a 50-50 deal would likely be met with laughter by Hearn. He’s not seeing Fury as being equal to Joshua for what he brings to the table with his high pay-per-view numbers, and the large stadiums that he’s now filling for fights with Carlos Takam and Wladimir Klitschko. Fury is not in a position of strength right now in negotiating a fight with Joshua. When Fury comes back and gets some wind under his belt while drawing boxing fans, then he’ll be able to push for a bigger split. Negotiating right now for a fight with Joshua is unwise on Fury’s part. Fury needs is promoters to do the negotiating for him for the Joshua fight when the time comes. Hearn will not give Fury a bigger cut, because he doesn’t need to. Joshua can fight plenty of other opponents and make a lot of money by taking the bigger cut of the venue. Joshua’s mandatory challengers are getting a 75-25 split. His voluntary challengers likely in the 80-20 or possibly 85-15 range. Joshua is going to be able to make the money he’s been accustomed to making if he gives Fury a 50-50 split. ”But at the moment, we shouldn’t even be considering this fight until we see if he can do something rather than just talk about it. Because that’s all I see, someone who has 6st to go and talks a good game but let’s actually see him back in the ring,” said Hearn. ”Fury doesn’t want the AJ fight yet, he knows deep down he will get mauled,” said Hearn. Fury wants the fight with Joshua, but he’s going to drive a hard bargain. It was the same way when he was negotiating with Wladimir Klitschko in his last fight in 2015. Fury and his management did an excellent job of negotiating that fight. There’s speculation that Fury could be signing with promoter Frank Warren. If that turns out to be true, it’ll make things a little trickier in working out a deal for the Joshua-Fury fight. Hearn wants Fury to sign with him. He recently gave Fury a 3-fight proposal for him to fight Tony Bellew, Dillian Whyte and then Joshua. Those are all fighters in his Matchroom stable.